Arwa Abouon (b. 1982, Tripoli, Libya) emigrated to Quebec, Canada with her family at a young age and graduated with distinction from Concordia University with a Bachelor of Fine Arts (BFA) degree in 2007. As a visual artist straddling two vastly different cultures, her work addresses important issues such as identity, duality and spirituality, yet is approached with a particular openness and sense of humour. Abouon’s narrative is largely autobiographical in nature, with the subjects of her portraits often being her immediate family and herself, spanning across generations and genders. Her work is informed by the increasing “visibility of Islam” in the West and the socio-political ramifications of living and growing-up in a post-9/11 world. First of all I am Muslim. When I describe myself, I put it in order: Muslim, Libyan, Canadian. Here I’m Libyan, but when I go to Libya, I’m Canadian. 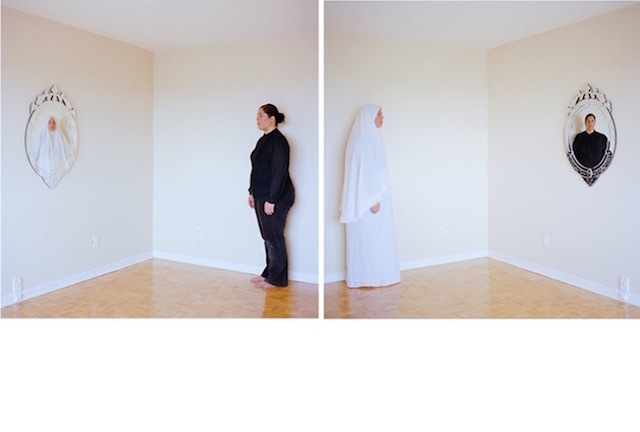 Arwa Abouon, ‘I’m Sorry/ I Forgive You’ (diptych), 2012, digital print, 30 x 40”. Image courtesy the artist. The themes addressed in my work stem directly from my life experience as a female artist living and working between cultures, and yet the aim is to show how a single person’s ‘double vision’ can produce images that possess much wider social effects by collapsing racial, cultural and religious borders. 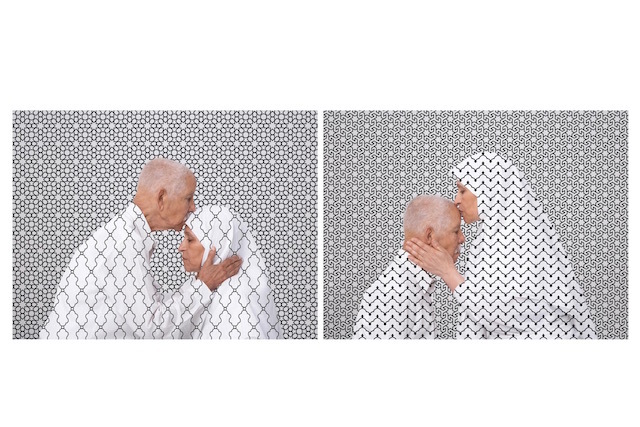 Abouon’s photography, video, design and installations regularly incorporate the three pillars of traditional Islamic design: symmetry, repetition and rhythm while largely avoiding themes that frequently dog diaspora artists: marginalisation and discrimination. 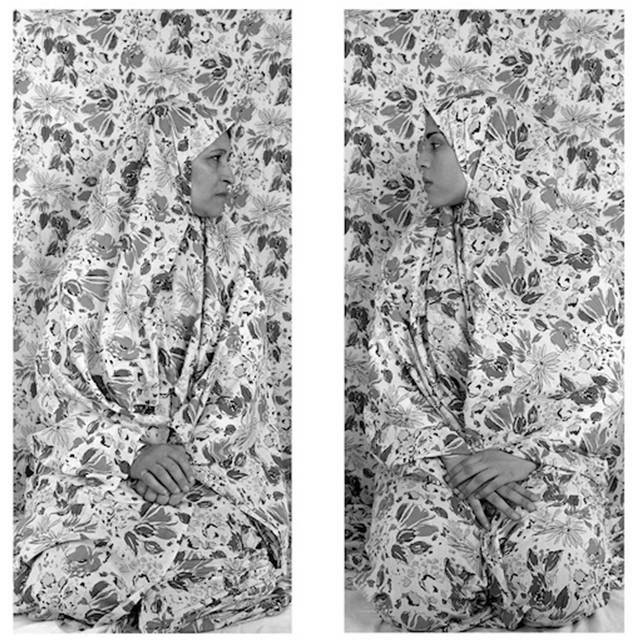 As a “self-identifying practising Muslim,” the artist seeks to introduce and examine her religious roots, while elevating Islam to a level beyond the hijab and politics. My ultimate aim is to sculpt a finer appreciation of the Islamic culture by shifting the focus from political issues to a poetic celebration of the faith’s foundations. Abouon’s first solo show in the UK, Birthmark Theory, is in conjunction with the Nour Festival of Arts and in partnership with Noon Arts. The exhibition held at londonprintstudio is considered a retrospective of the last ten years of her work and includes ‘Mirror Mirror/Allah Allah,’ ‘I’m Sorry/I Forgive You’ and the ‘Abouon Family,’ among others. We are delighted to have artist Arwa Abouon with us for a few days, coming all the way from Montreal, Canada. It has been an incredible feat that could not have happened without the support of the Nour Festival and the londonprintstudio. More wonderful is the fact that the local North African and Muslim communities have been engaging with the artwork and asking lots of questions. Birthmark Theory runs at the londonprintstudio through 7 November 2015. This profile was written by Lisa Pollman, a freelance writer who connects Asian and Middle Eastern artists to the world. ← The Middle East and North African food at a glance!